The Sportspal by Meyers is manufactured from Aircraft Grade Aluminum, which is then stretch-formed, heat treated and hardened. The two piece hull is joined at the keel. This makes the Sportspal by Meyers very durable. The Sportspal by Meyers, Made in the USA, should not be confused with another canoe manufactured in Canada, whose hull is composed of thinner (0.022), softer (marine grade) aluminum. The Sponsons and Liner on the Sportspal by Meyers are also larger and thicker than the Canadian model. *NOTE ADDITIONAL SHIPPING CHARGES MAY APPLY TO CERTAIN ZIP CODES PLEASE CONTACT US TO CONFIRM YOUR SHIPPING QUOTE. All models are available in birch bark, olive drab, green and red. Package includes attached gunwale seating (unless Eathamfoam Seating requested) (2) AC12 Wooden Sportspal Paddles and (1) AC16 Motor Mount. 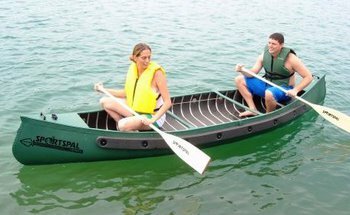 Note: Canoe in this listing pictured in green.